Anything related to politics that effect MYO. Apparently the good citizens of Oregon aren't listening to their Democratic Task Masters and voted DOWN a Tax Increase on cigarettes. Naturally, their Governor who is a democrat, implied that the voters are just too stupid for resoundingly rejecting his proposed amendment to the state constitution that would have enshrined additional cigarette taxes. Vancouver's hookah-parlour owners are celebrating after winning an exemption Thursday from a proposed new bylaw that will ban smoking on most sidewalks in commercial districts, in bus shelters and even in taxis passing through Vancouver. But Vancouver's planned new bylaw will prohibit smoking in any taxi travelling through Vancouver, even if the driver and all the passengers don't have a problem with it and even if the taxi is licensed in another municipality. It will also prohibit smoking within six metres of any entryway, window or air intake for a public building, which will effectively ban smoking on most sidewalks in commercial areas, since sidewalks are only three metres wide and doors are often less than six metres apart. And it will prohibit smoking on restaurant patios and at bus shelters. The one foggy point in the new bylaw was whether it will apply to crack cocaine and crystal-meth smoking...But health-protection director Domenic Losito said he didn't think so, since the bylaw is aimed at cigarette smoke. Has anyone here noticed the neame change for RTDA? Apparently, it is no longer politically correct to be associated with cigarette smokers. I don't like it that my child is targeted by a website that suggests the word f#ck in its name. This is a true manifestation of a Nanny State. WASHINGTON (AP) - The federal agency charged with keeping food and drugs from harming people may soon be asked to take a consumer product that kills more than 400,000 people a year and make it safer. The product is the cigarette—generally acknowledged as anything but safe. Smoking accounts for nearly one in five deaths in the United States. That toll can be reduced, tobacco foes say, and they point to a bill that is expected to pass a Senate committee Wednesday as the tool to make it happen. The legislation would give the Food and Drug Administration the same authority over cigarettes and other tobacco products that the regulatory agency already has over countless other consumer products. It's not something the agency necessarily wants, according to past comments by FDA commissioner Dr. Andrew von Eschenbach. After the last major increase in Ohio's cigarette taxes I realized there is a major deception being perpetrated. How many people are aware that Ohio's cigarette taxes are paying for the state mandated vehicle emission tests? It was argued that a massive increase in tobacco taxes was necessary to provide health care for smokers yet somehow it has been funneled into the pockets of those holding the contract for emission testing. What, non-smokers don't own automobiles? Those of us who live in Cuyahoga County pay higher taxes on tobacco products than surrounding counties. We're paying for a baseball stadium, football stadium, basketball arena, renovations to the art museum... no smoking allowed. Now they want to increase cigarette taxes again... to increase funding for schools. So, there's no non-smokers with children? I'm surprised there hasn't been any uproar over the common practice of compound taxation. What do I mean by this? Simply, taxes imposed at the state, county, and city level are added to the base price of a pack or carton of cigarettes. When a customer purchases the cigarettes, as with all non-food purchases they are charged sales tax. The way taxes are imposed on tobacco products, the customer is paying sales tax on the taxes already included in the price. So, a $10.00 a carton tax increase imposed by the state means a $10.75 a carton increase in revenues. Regardless of the level at which the tax is imposed (state, county, or city) the state benefits from the sales tax imposed on the other taxes. The finance committee has decided to raise federal taxes by 61 cents a pack on cigarettes, plus raise taxes on other tobacco products. Republican Grassley and Democrat Max Baucus are two of the villans. It is becoming clearer this is a way to funnel money to the insurance companies for their political donatons to the gangsters now in office. The fifty billion dollar tax will only cover a few million more. The federal government pays 70% of the cost of insuring children and the states pay the rest. What is wrong with that picture? Children are the most profitable group to insure. Sure there are a few that get serious medcal problems, but the percentages are for most to stay healthy and almost cost free. If the government were concerned about the health of children they would pool tax money and pay as they go instead of giving most of it as profit to the insurance companies and their cohorts the drug companies. When did it become the government of the insurance companies, by the insurance companies, for the insurance companies? They are bankrupting Medicare as I type, all the while saying government can't run a successful program, while they drain the money from it. 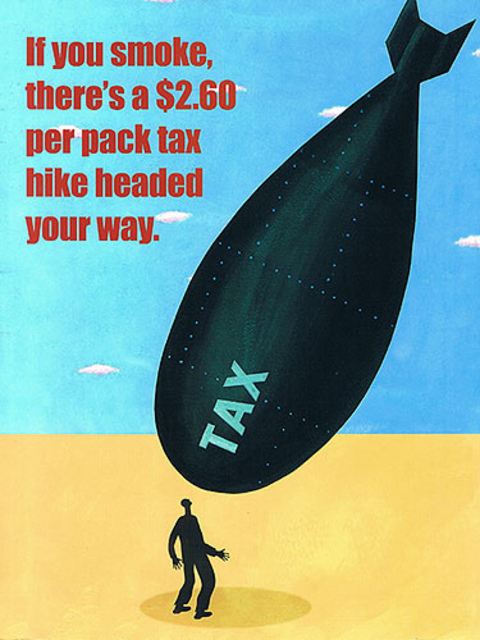 Here in Indiana taxes on premades went up 44 cents per pack, and OTP taxes went from 18 per cent to 24, effective July 1. A one pound bag of Stoker's Number 2 went from $15.99 (plus 6% sales tax) to $17.69 plus tax. Still beats buying factory smokes, though. I'd go buy my stuff in Kentucky, but I live far enough away from the nearest outlet that at present gas prices it isn't worth the drive. Commissar John Lynch of the former state of New Hampshire is the latest in a growing line of anti-rights lackeys seeking to have his will (as well as the will of a handful of Big Dollar Political Contributors) imposed upon the Little Man by signing "law" creating a smoking ban in 90 days. Welcome to America's 21st century version of a free society. I wasn't a cigarette smoker when the MSA was signed and so paid it scant attention, but I vaguely remember reading that the money was to be used by the states for addressing health issues related to smoking, or alleviating the cost to the states of treating smokers (which of course would mean smokers on Medicaid, I assume). Can someone tell me if the agreement requires the states to do anything specific with the money? The reason I ask is because of this article in the Cleveland Plain Dealer, some of it quoted below. "Gov. Ted Strickland's suggestion that Ohio should get as much money as it can now from a national tobacco settlement makes sense. Less obvious is whether the governor's plans for those dollars represent the best investment for Ohio's future. Strickland proposed "securitization" - essentially selling the rights to Ohio's annual payments in exchange for a lump sum - as part of his State of the State address. It's a move that several states have embraced and is well-timed, given uncertainty about future allocations. Strickland says the state would receive $5 billion, which he would use to finish school construction work statewide and to expand the Homestead Property Tax Exemption for senior citizens and the disabled." It appears the money is being treated like the pot of gold at rainbow's end, ludicrous largesse picked from the pockets of millions of smokers who had no say in the matter. I don't get it.